The official meet was supposed to be at a new campsite for the EMC, Ashaig near Broadford which looked idyllic from the website. However, a pre-meet inspection by Kenny and me as Michelin campsite star assessors resulted in a change of plan. The small wooden shack with WC on it at the entrance gave a clue that facilities were perhaps not quite as presented on the website. Despite the potential crowds of Whit weekend, the majority vote went to Glen Brittle. The forecast was also looking a bit unpredictable but its Skye so you have to go anyway! Martin arrived first and pitched well back from the masses. However, after being informed that a party of 80 students was due to arrive beside Martin’s spot, the rest of us declined to follow his example. Saturday was drizzly with low cloud. At least it gave Martin a chance to acquaint himself with the campsite’s resident pet snake – Sid. The weather also didn’t stop lots of folk with loud voices gearing up in the campsite and heading up the path wearing helmets and harnesses. Eventually 8 of us headed off for the classic Coire Lagan round (Kenny, Alison, Anne C, Fiona M, Chris, Martin, Eileen and Rebecca). The harness and helmet wearing brigade who had left at least an hour ahead of us were spotted way back on the path as the mist cleared briefly. However for the rest of the day it was mist and damp rock. Hardened by years of EMC trips to Skye in the 80s and 90s Skye gurus Martin and Kenny led the way. 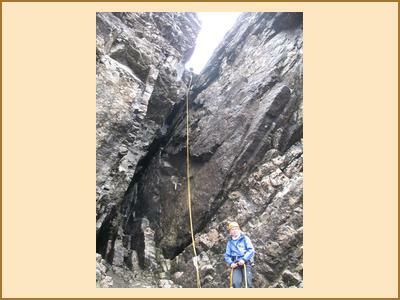 The scrambling was relentless and an interesting experience for Cuillin first timers Eileen and Rebecca. 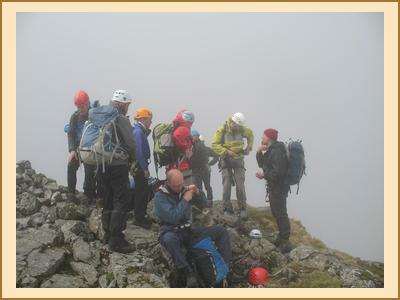 After Collie’s Ledge and Sgurr Mhic Choinnich, we pushed on towards the Inaccessible Pinnacle, passing a nervous looking roped party on the Grade 3 An Stac scramble and then past several roped parties on the In Pinn, completing our collective abseil before most of them had got to the top. Kenny did ask politely if it was OK to go past – not sure they realised there were another 5 to follow! The harness and helmet wearing brigade arrived back on site much later and still wearing helmets etc all the way back to their tents. With about 500 folk on the campsite the Glenbrittle facilities (4 showers) were coming under serious pressure and for the rest of the weekend there were long periods where the site ran out of water literally. Eileen and Rebecca were leaving on Sunday and opted for a coastal walk. The rest of us and Pete and Sara decided to do Pinnacle Ridge on Sgurr nan Gillean, another classic scramble with the lure of Kenny’s special subterranean cave exit at the end. We could hardly contain our excitement. Somebody else had clearly not been able to contain their excitement at the first abseil and poor Fiona M had to spent the longest period of time beside the unpleasant smell as she was last to abseil. After the summit Martin led us down the West Ridge revelling in the exposure of his Nicholson chimney avoidance route. A tricky down climb onto Am Basteir and the search was on for the subterranean exit. There was a moment of panic when Kenny announced that it was “gone” and had been “filled in” but it turned out he was looking in the wrong place. Another abseil followed before we squeezed through a narrow tunnel and then used an old sling to swing down into the cave followed by a spectacular 25m abseil and an easy walk back to the Slig. Skye at its best! The forecast was even better for Monday and a mass attack on the Cioch was in order. Between us 7 routes were done followed by fish and chips in Kyle on the way home – Cioch West – Martin & Chris and Fiona & Anne, Cioch Nose - Fiona & Anne, Slab Route, Kenny & Alison, Integrity, Kenny & Alison and Fiona & Anne, Arrow Route – Sara and Pete. We decided that the Skye trip in May must be reinstated so that the rest of us can carry on the club tradition and become Skye gurus like Martin and Kenny.